June 5, 2013 - With a career that spans across three decades and a warfighting reputation that rivals nearly every aircraft in the Air Force's arsenal, the B-1 Bomber has established itself as one of the United States' most crucial assets to maintaining air and ground superiority. This achievement was built on the backs of hundreds, if not thousands, of Dyess maintainers who have kept this Cold War bird fighting well into the 21st century. With the bomber's ever increasing role in today's combat operations, pushing the airframe to the limits of its original design, skilled maintenance professionals are crucial to ensuring mission success. Located within one of Dyess' most prominent landmarks the "Global Power for America" hangar is the 7th Equipment Maintenance Squadron's maintenance flight - a group of roughly 40 maintainers who strip this aircraft down to its frame only to inspect it, repair it and put it back together. 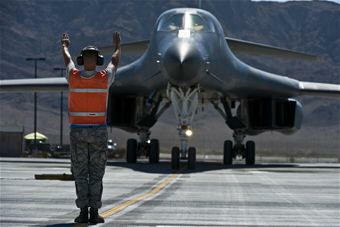 "Most B-1 aircraft are around 26 years old and require a lot of maintenance to keep mission ready," said Senior Master Sgt. Mark Mueller, 7th EMS maintenance flight chief. "The isochronal inspection, better known as ISO, is a vital part of this effort. With a keen eye and dedication to duty these inspections make the daily maintenance easier. The effort is about finding and replacing the parts that failed, or are about to fail, before they cause mission delays." Each year, this dedicated flight of Airmen inspect more than a dozen B-1s inside and out, manually removing approximately 215 panels just to begin the process. This is the beginning of a tedious and painstakingly complex list of tasks that ensure this heavily-employed bomber continues to provide constant overwatch for troops on the ground. "ISO has a specific flow of how the maintenance is accomplished to make sure everything gets completed on time," said Staff Sgt. Matthew Johnson, 7th EMS. "Day one is our de-panel day and most of the time if the jet is playing nice, we can de-panel 90 percent of the aircraft in just one day." From there, thousands of items are inspected for any discrepancies the aircraft may have and are repaired or replaced. The quality assurance shop then performs a follow-up inspection to ensure any repairs made to the aircraft were done correctly. Once again, the tedious process of re-paneling the aircraft takes place, manually reinstalling each individual screw by hand. "We then apply hydro-power and preform an operational check out of the components that have been disconnected or replaced," Johnson said. "QA performs one last follow-up inspection and run the engines to complete the rest of our operational check outs." The 7th EMS maintenance flight is allotted 15 to 18 duty days to complete this entire process, a objective that isn't friendly to the personal lives of these Airmen. "For us, the duty day doesn't end until the job is completed. If we get behind for some reason or we find something that requires labor intensive disassembly we will work right through the weekend to ensure everything is done correctly," Mueller said. "Our main objective is to keep the aircrew safe, keep the aircraft in the air and ensure freedom for everyone," he added. "One mistake on our part and we jeopardize that objective." Furthermore, unlike many Airmen who move from station to station every few years, Dyess maintainers rarely leave the B-1 platform, some spending their entire Air Force careers mastering every inch of the super-sonic bomber. "This is a blue-collar, down-in-the-weeds type mission we have here," Mueller said. "The job we do isn't glamorous nor is it in the spotlight, but I could not be prouder of the men and women of the 7th EMS maintenance flight and their contribution to the freedom of the United States."